I love taking part in blogger story type posts, as it always nice to take a step back and write about something different. 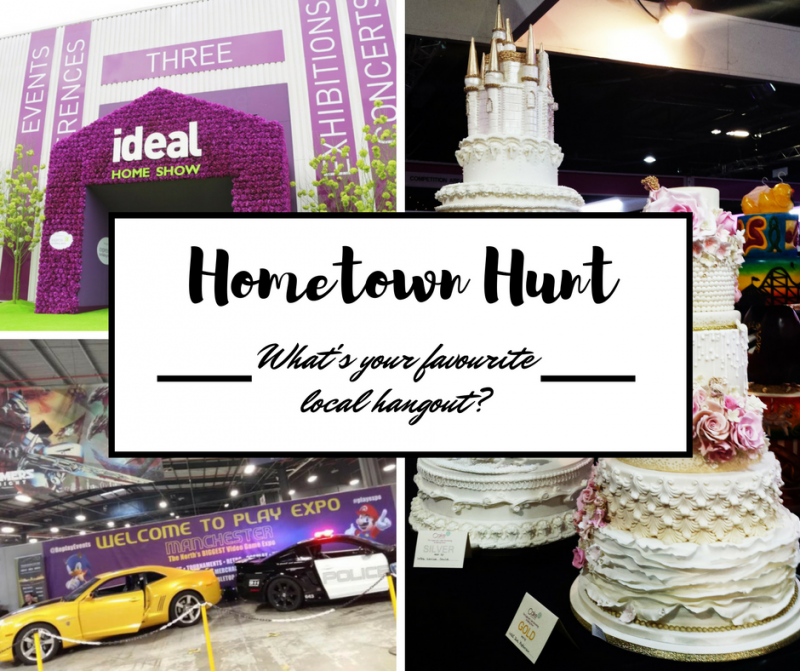 So when Eventbrite started Hometown hunt and asked people to talk about their favourite local gems well it got me thinking about mine. Most people who took part in this project spoke of quirky little restaurants, cafe’s, tea rooms… but when I think of my local haunt, well it’s a little different. A little bigger. I am fortunate to live in the wonderful region known as Greater Manchester. Fortunate enough to live no more than 15 minutes from the city. And a mere ten minutes from Trafford – home to Old Trafford stadium (not so lucky about that one), Old Trafford cricket ground, The Trafford Centre and Eventcity. And it is Eventcity that I choose as my favourite spot. I know, it’s a large brash exhibition venue plonked right next to the one of the busiest centres in Manchester but its on my doorstep! And these days, I find myself there on a regular basis. As a venue it is so versatile. If you’re ever looking for something to do over the weekend, the chances are something is definitely happening there! I wrote some time ago about the problems I sometimes have when thinking of things to do in the city, there are times when I seem to draw a blank. That’s the best thing about Eventbrite, it provides a comprehensive list of what’s on, and it doesn’t just advertise the really big headliners. It gives smaller businesses a platform to organise ticketed events without having the drama of setting up online ticket sales. And for us ticket-buyers, it collects said events into one spot. For example in just two clicks I can pull up everything that’s happening in Manchester this weekend! Have you got anything planned? no? Well holding top spot on the list for Halloween weekend is the amazing Muslim Lifestyle Expo being held at yup, you guessed it, Eventcity, Trafford Park. 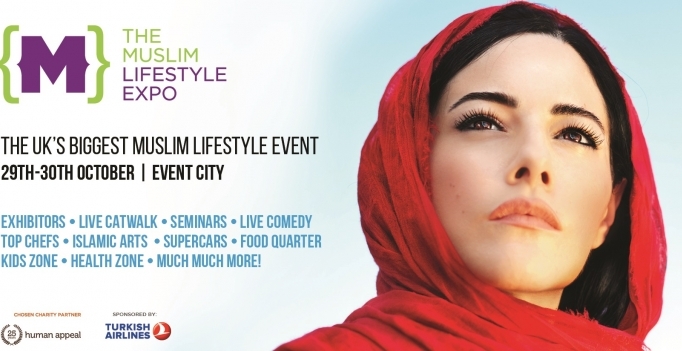 This is the UK’s biggest event showcase of the Muslim consumer market and is expected to attract thousands of visitors this weekend. Don’t be fooled by the name, this isn’t just for Muslims, the show is open to everyone and is a great insight into one of the most peaceful and beautiful religions of the world – one that gets a LOT of bad press! This event is a fantastic opportunity to meet and shop everything from fashion to holidays. The event will feature over 100 exhibitors from sectors including finance, food and drink, health and beauty, media. Manchester Art Gallery will also take part by providing a workshop on Islamic arts and showcase Islamic artefacts over the weekend, which sounds incredible! The interactive Expo will also feature a live catwalk and comedy by British Muslim comedians like Aatif Nawaz and BBC Three’s very own Guzzy Bear. Word of advice, get your tickets online before you go, the price on the door will be more expensive (standard). hmm ok I seem to have side tracked… basically with websites like MEN, Manchester Confidential, Whatson Manchester. there really is no excuse to miss out on things, but I would definitely add Eventbrite in there as you will find some truly amazing intimate events being held right on your doorstep. And if you’ve got ants in your pants like I do, there’s nothing worse than not finding something fun to do! This weekend I’ll be back at my usual spot at the Muslim Lifestyle Expo and then in a few weeks I’ll be returning for the Ideal Home show (more on that to come! check out my tips from the last one). I’ve been to gaming expos, baking shows, renovation exhibitions, they even have almighty fitness session when Les mills comes to town. What’s your favourite hometown spot? As always all opinions and views on here are all mine and mine alone – but the Muslim Lifestyle Expo pic is not!